Last week I entered a giveaway on Sauce Magazine's blog. 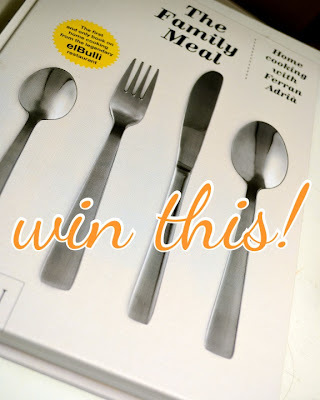 They were giving away Ferran Adria's cookbook, The Family Meal. Adria is know for his ultra-fancy molecular gastronomy cooking... recipes very few home cooks could make at home. This book, however, is aimed at the home cooks. Simple recipes that anyone can make, complete with step-by-step photos! It's a great book. So great, that I actually bought myself a copy online before the results of the giveaway were announced (I won!)... so I have 2 copies! Whoops. I figured it was the perfect excuse to hold Iron Stef's first-ever giveaway! See details on how to enter after the recipe. The recipe I chose from the book for this post is one of the simplest. Sausage and Mushrooms. The key to many of the recipe is the quality of the ingredients... this one called for a sausage called "Butifarra" or any other good-quality coarse-ground pork sausage. I had some potato bratwurst from Swiss Meats, a wonderful meat processor about an hour from St. Louis. It's probably nothing like Butifarra, but it is good quality, and the dish turned out fantastic. I also discovered the joy of squeezing sausage from it's casing. Is it weird that I enjoyed that so much? When I first read that you cook the mushrooms in a separate pan from the sausage before combining them, my lazy voice piped up..."you'll have to wash 2 skillets. is that really necessary?" But then realized that questioning Ferran Adria was really really stupid. I'm glad I followed directions. The mushrooms got nice and browned, as did the sausage, and I bet that cooking them together, the shrooms would have let off too much liquid and there would have been less caramelization. And even though you use 2 pans, this dish is SUPER simple, with richly flavored delicious results. Squeeze the sausages from their casings, pinching into walnut-size balls. Heat 2 Tablespoons of the oil in a skillet, and fry the sausage balls until golden brown on all sides. Add the garlic, rosemary and thyme to the sausage, and fry for 5 minutes. Pour the Sherry into the pan and scrape up all the browned pits from the bottom of the pan. turn heat to low. In a separate pan, fry the mushrooms in the other 2 Tablespoons of olive oil for about 5 minutes until they are nice and browned. Add the mushrooms to the sausage, turn the heat to medium and let cook, stirring occasionally, for 15 minutes. Turn off heat, stir in parsley and serve with crusty bread. Now... about this giveaway. I am giving away 1 copy of The Family Meal by Ferran Adria. To enter: leave a comment on this post about your favorite 2 or 3 ingredient recipe. For an additional entry, "Like" Iron Stef of Facebook, and leave another comment here saying you've done so (if you already "like" me, leave a comment telling me that). Entries must be made by Noon CST on Tuesday, January 3. I will draw a random winner on Tuesday, January 3, 2012. Good luck!! 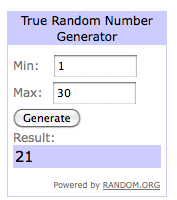 The Winner of the Cookbook is comment number 21... Congratulations to Troy!! I'll be getting in touch with you. Thanks to the rest of you for commenting... some great ideas for simple meals here! Happy New Year!! I just Liked you on Facebook! But I can't think of a simple enough recipe right now! As you know I like to work with peppers...my two favorite are jalapeno and habanero. Habanero because it takes it to the next level every time, plus it just has great flavor, and Jalapenos because, despite their inconsistent heat, always taste delicious. I can think of two great, quick recipes. One, is for tomato sauce. Take one large can of unsalted plum tomatoes, or blanches and peeled ripe tomatoes in season. Some people like to remove the seeds, I say whatevs. Cook down at medium heat for about 30 min or until the tomatoes have given away. Meanwhile, in a small sauce pan, heat 1/4 cup olive oil, two cloves garlic thinly sliced and a teaspoon or more of red pepper flakes. Cook at very low heat, so not to burn oil or garlic, but infuse their flavors. I let it go about 10 min. Strain oil to remove food and spice bits. Salt and pepper to taste. Once tomatoes have cooled a bit, puree with immersion blender to a smooth sauce. Add strained oil. At this point, I usually put away in fridge and let muddle. I serve the next night tossed with pasta and a little pasta cooking water, freshly grated cheese, and maybe a handful of parsley and crusty bread. My BF (a picky eater himself) loves it, and I use it to bake with meatballs, spread on a pizza crust, or spoonfuls added to sandwiches and soup calling out for a simple tomatoey touch. Yum! Tomato Bisque Soup, Can of Rotel, and Cooked Hamburger....Combine together and enjoy with a grilled cheese sandwich with tomato and basil.. Yummy! My fav 2-3 ingredient recipes are soups that I make in the Vitamix...steamed broccoli, chicken stock, cream. OR...whole tomato, basil, stock. YUM. Red beans and rice with spicy cajun sausage. Loads of flavor, super simple. I liked your facebook page (Rust Hawk). Thanks! Fry up some meat (pepperoni, ham, leftover chicken). Remove from pan. Mix eggs and milk, season. Pour in to hot skillet. When mostly cooked, add meat back to pan. Okay, sure, it's just scrambled eggs, but it's a regular easy go to dish around here. Favorite few ingredient recipe is a caprese grilled sandwich - tomatoes, mozzarella, & basil! Yum. roasted peppers stuffed with goat cheese and pine nuts. ooohhh.. I already like you on facebook! Brussels sprouts roasted in pork rilletes or pancetta. yum. I think my favorite recipe with few ingredients is tomato soup, and now that I have an immersion blender, it's even easier! One of my favorite three ingredients recipes is grilled nectarines with prosciutto and balsalmic vinegar ... cut nectarines into wedges, wrap with thin slices of prosciutto, then grill over medium-high heat, turning often, until the prosciutto begins to crisp. Remove from grill, drizzle with a touch of balsalmic vinegar ... enjoy! I'm currently obsessed with frying things in pork rillettes - eggs for breakfast or brussels sprouts. Yum. I would totally make this, but hubby hates mushrooms. Hmm, maybe next time he's out of town. I just discovered roasted cauliflower. So easy, so delicious, and so healthy. Caprese Salad, simple, fresh and tasty. Caprese Salad. Fresh and Simple. I love anything with sausage and garlic. I usually double the garlic when I make recipes at home because I just can't get enough of it! And sausage is just delicious, no matter what you serve it with! This came to be my absolute favorite pasta sauce when I was working in Italy; a carbonara is so simple, but requires some technique not to scramble the eggs, truly elegance in simplicity. Pancetta(or if you have access to guanciale - in which case, major culinary points to you), eggs and pepper are all you really need. Whisk the eggs with quite a bit of peppers, I like to use a lot personally. Saute brimoised pancetta/guanciale with a little olive oil, add the spaghetti when it's al dente, add the egg mixture off the fire and mix mix mix DON'T LET IT SCRAMBLE! In the bowl, top with grated parmesan/grana padana and enjoy! I think I already like you on facebook and follow you on twitter too. anything that involves peanut butter + banana! My favorite 4 ingredient recipe is the salad I make with prosciutto, arugula, Grana Padano and balsamic (and olive oil). Okay, so that's 5. And I like you a whole lot on Facebook already. I dig a simple salad with arugala, lemon juice olive oil and a poached egg. Fast and tasty. And already a facebook fan!